Manhattan Theatre Club’s world premiere of The World of Extreme Happiness, the new play by Frances Ya-Chu Cowhig, directed by Eric Ting, opens tonight, Tuesday, February 24 at MTC’s New York City Center – Stage I (131 West 55th Street) in a co-production with Chicago’s Goodman Theatre. The MTC cast of The World of Extreme Happiness features Francis Jue (M. Butterfly, “The Good Wife”), Telly Leung (“Glee,” Godspell), Jennifer Lim (Chinglish, This Isn’t Romance at London’s Soho Theatre), Jo Mei (New York stage debut and star of the acclaimed independent film A Picture of You), James Saito (Golden Child, “Life of Pi”), and Sue Jin Song (Paula Vogel’s Hot 'n Throbbing). Unwanted from the moment she’s born, Sunny (Jennifer Lim) is determined to escape her life in rural China and forge a new identity in the city. 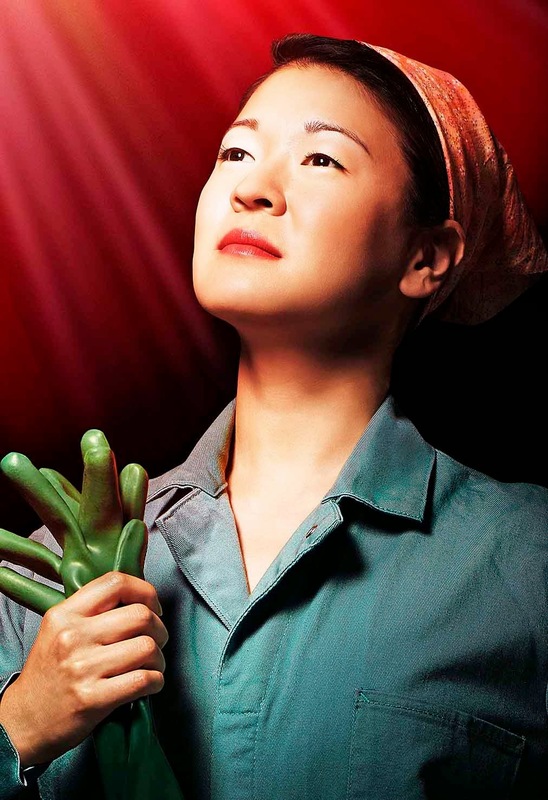 As naïve as she is ambitious, Sunny views her new job in a grueling factory as a stepping stone to untold opportunities. When fate casts her as a company spokeswoman at a sham PR event, Sunny’s bright outlook starts to unravel in a series of harrowing and darkly comic events, as she begins to question a system enriching itself by destroying its own people. The creative team for The World of Extreme Happiness includes Mimi Lien (scenic design), Jenny Mannis (costume design), Tyler Micoleau (lighting design), Mikhail Fiksel (sound design), and Thomas Schall (fight director). Now celebrating its 90th year, Goodman Theatre is an artistic and community institution dedicated to the art of theater and civic engagement. Chicago’s flagship located in the heart of the downtown Theater District, the Goodman is distinguished by the quality and scope of its programming and its culturally and aesthetically diverse creative leadership—including Artistic Director Robert Falls and his esteemed Artistic Collective. Artistic priorities include new plays, reimagined classics, culturally specific works, musical theater and international collaborations. Under Mr. Falls and Executive Director Roche Schulfer, the Goodman has generated more than 150 world or American premieres and nearly 30 new-work commissions. Awards include two Pulitzer Prizes; 22 Tony Awards, including Outstanding Regional Theatre (1992); and nearly 160 Joseph Jefferson Awards. Joan Clifford is Chair of the Board of Trustees, Swati Mehta is Women’s Board President and Gordon C.C. Liao is President of the Scenemakers Board for young professionals. Tickets for The World of Extreme Happiness are available by calling CityTix at 212-581-1212, online by visiting www.nycitycenter.org, or by visiting New York City Center box office (131 West 55th Street). All tickets are $85. · THROUGH SUNDAY, MARCH 1 (WEEK OF OPENING): Wednesday and Sunday at 7 PM; Thursday through Saturday at 8 PM. Matinees on Saturday and Sunday at 2 PM. The curtain time for opening night on Tuesday, February 24 is 6:45PM. · MONDAY, MARCH 2 – SUNDAY, MARCH 8: Tuesday at 7 PM; Wednesday through Saturday at 8 PM. Matinees on Wednesday, Saturday, and Sunday at 2 PM. · MONDAY, MARCH 9 – SUNDAY, MARCH 15: Tuesday and Wednesday at 7 PM; Thursday through Saturday at 8 PM. Matinees on Wednesday, Saturday, and Sunday at 2 PM. · MONDAY, MARCH 16 – SUNDAY, MARCH 22: Tuesday and Wednesday at 7 PM; Thursday through Saturday at 8 PM. Matinees on Saturday, and Sunday at 2 PM. There are only 7 performances on sale to the public this week. · MONDAY, MARCH 23 – SUNDAY, MARCH 29: Tuesday and Wednesday at 7 PM; Thursday through Saturday at 8 PM. Matinees on Wednesday, Saturday, and Sunday at 2 PM.